April 16, 2012  Singing in a number of South African languages, as well as English, Soweto Gospel Choir fuses the praise music of many Christian cultures, with nods to traditional African songs of celebration — complete with occasional clicks and bird songs. 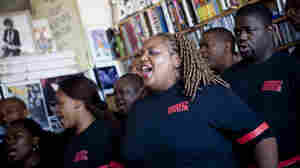 February 8, 2006  Ever since their smash debut CD Voices From Heaven, the Soweto Gospel Choir have spent years touring the world with their exhilarating brand of vocal fireworks. The group returns with a new collection of songs sung in English and some of the 10 other "official" languages of South Africa. February 4, 2005  South Africa's Soweto Gospel Choir combines traditional African gospel and Western Christian music to form a rich sound. In a visit to NPR, the group performs songs from a new CD, Voices from Heaven.